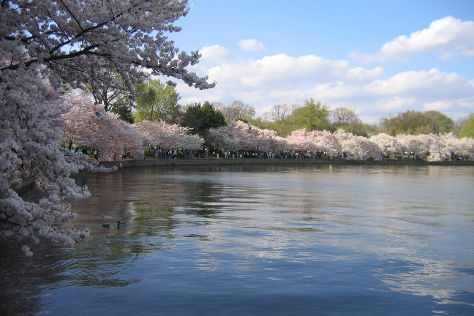 Start off your visit on the 23rd (Sun): tour the pleasant surroundings at National Zoological Park, contemplate the waterfront views at Tidal Basin, and then admire the masterpieces at National Gallery of Art. Here are some ideas for day two: examine the collection at National Air and Space Museum, then contemplate the long history of Audubon Naturalist Society Woodend Sanctuary, then contemplate in the serene atmosphere at Washington National Cathedral, and finally appreciate the history behind Vietnam Veterans Memorial. For other places to visit, more things to do, and other tourist information, you can read our Washington DC holiday tool . The Route module shows you all the different ways you can get to Washington DC. In December, daily temperatures in Washington DC can reach 51°F, while at night they dip to 37°F. Wrap up your sightseeing on the 24th (Mon) to allow time to take a train to Philadelphia. Start off your visit on the 25th (Tue): witness the site of a historic battle at Valley Forge National Historical Park, ponder the design of Longwood Gardens, and then take a stroll through Society Hill. Here are some ideas for day two: admire nature's wide array of creatures at Philadelphia Zoo, then ponder the world of politics at Independence Hall, then get to know the fascinating history of Independence National Historical Park, and finally shop like a local with Rittenhouse Square. To find reviews, more things to do, photos, and tourist information, read our Philadelphia trip itinerary planning site . Traveling by train from Washington DC to Philadelphia takes 2 hours. Alternatively, you can drive; or take a bus. In December in Philadelphia, expect temperatures between 48°F during the day and 35°F at night. Wrap up your sightseeing on the 26th (Wed) to allow time to take a bus to New York City. Take a break from the city and head to Narwhal Yacht Charters and Bronx Zoo. Head to Fifth Avenue and Tiffany & Co.for plenty of shopping. The adventure continues: make a trip to Times Square, steep yourself in history at Hamilton Grange National Memorial, explore the world behind art at The Museum of Modern Art (MoMA), and take in the pleasant sights at Central Park. To find other places to visit, where to stay, more things to do, and tourist information, go to the New York City trip itinerary maker app . Take a bus from Philadelphia to New York City in 1.5 hours. Alternatively, you can take a train; or drive. In December, plan for daily highs up to 48°F, and evening lows to 36°F. Finish your sightseeing early on the 1st (Tue) to allow enough time to travel to State College. State College is a home rule municipality in Centre County in the Commonwealth of Pennsylvania. On the 2nd (Wed), admire the majestic nature at Whipple Dam State Park, tour the pleasant surroundings at Tom Tudek Memorial Park, then take in nature's colorful creations at The Arboretum at Penn State, and finally identify plant and animal life at Millbrook Marsh Nature Center. To see more things to do, maps, ratings, and tourist information, read our State College online tour itinerary maker . Traveling by car from New York City to State College takes 4.5 hours. Alternatively, you can fly. Traveling from New York City in January, things will get slightly colder in State College: highs are around 33°F and lows about 19°F. Wrap up your sightseeing on the 2nd (Wed) early enough to travel back home.